This is one of the more strictly casual Fairies that you won't see in many competitive builds. The effect is nice, but I honestly would of preferred something card advantage oriented (IE. Airknight Parshath). You generally aren't too worried about your life points once you have a 2800 ATK threat on your side of the field. You can always look at the life point gain as an extensive abuse to Magical Scientist. It all depends on what your deck is trying to accomplish, but this is definitely a card that should be kept to casual play. In Limited, you win. Period. Just pray that no one opened CED or BLS, and you'll be in good shape. 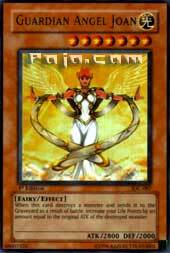 DM7FGD Guardian Angel Joan.. One of my own personal favorite Monster cards in the game. For starters, for a Monster that requires 2 Tributes, stats of 2800/2000 are very good. And its Effect just makes those stats even more beneficial. I believe LP-gain to be an underrated and very effective tactic in Duel Monsters. I've been playing an LP-gain/burn-based Deck for a while now, always using 1-2 Joans, and I must say Joan is an extremely effective card. And it'll be able to get by just about anything your opponent might have up against you. Guardian Angel Joan is the better version of her fusion counterpart. This is just a normal 2-sac light monster(1 with Kaiser Seahorse). The best part is her special ability. She can gain you a lot of life while she kills creatures. Attack Jinzo and gain 2400 and kill Jinzo, dealing 400 to them. Almost broken. She is unsearchable however. She also has to send the creature to the graveyard, so banisher would shut her effect down. Give her Cetus of Dalga and she is a 330 trampling behemoth that gains you life for every casualty she causes. I give Guardian Angel Joan a solid 7/10. The life gain is the best thing about her. Coincidentally, I just traded one of these away...time to see whether or not that was a good decision. Two tributes for 2800 isn't that bad. Given that it's Light, a Deck with some of this and three Kaiser Sea Horse won't have much of a problem at all getting this baby to the field. The effect is what will sell it to most people. Kill something, gain life. Kill a Jinzo, gain 2400. Kill a beatstick, 1900. Life Gain is not a very viable option in Yu-Gi-Oh; it doesn't matter how many life points you have if you get Yata-locked, or if you have no cards in hand and your opponent has two monsters beating you down. However, as just an added bonus for only 200 less attack than Blue-Eyes White Dragon (which you'd be using in this kind of Deck ANYWAY) it's not bad at all. One card to look at when using this is Cestus of Dagla (may have spelled that wrong). Equip that to this monster and watch your Life Points add up. Life gain usually isn't viable but gaining 3,000+ LP at once doesn't sound half bad. (Especially with how much stalling is done at Regional events when the player is ahead on life and close to when time is going to be called). Omega Guardian Angel Joan very much resembles Shinato Effect wise. But whereas Shinato does DAMAGE equal to the attack of the monster destroyed, Guardian Angel Joan increases your life points equal to the attack of the destroyed monster. This card is very interesting indeed. It is best used in either a life point gain deck, or one of my personal favorite decks, an Angel Deck. 2800 attack isn’t very bad for a 7 star monster. If you want to get this out quicker, either use Cost Down, or Tribute Doll. I’m giving Guardian Angel Joan a respectable 4/5 in an Angel deck. If you are running one of those than this would be a good asset to your team. Stats: A level 7 Light/Fairy, Guardian Angel Joan boasts a solid 2800/2000 effect. There is support for Light Monsters, but if there is support for Fairies, it didn’t stick out to me. The ATK is high enough that few creatures, at least unaided, will beat it. The DEF is high enough that should you put it in DEF mode or have it forced into DEF mode, it can survive most common beatsticks. Sadly, that is at the cost of making this card an illegal target for Witch of the Black Forest and Sangan. Card Text (Effects): The effect is interesting. When this card destroys a monster and sends it to the graveyard, you LP gets a boost equal to the original attack of the monster. Not a game breaking effect, but not a useless one either. Uses/Combinations: One could use it as a heavy hitter for either Fire Princess decks (with Chorus of Sanctuary to protect the Fire Princess since Gravity bind and Messenger of Peace would block Joan), but I think as the main attacker of a Light/Fairy deck might be better, perhaps with some LP Burning cards of your own-the idea being that Joan would make it safer to use those cards. Casual: 3.25/5-For use in the above decks. Constructed: 2.75/5-It’s not bad, just not that good. Limited: 4/5-Strong monster, and with the lower starting LP, gains seem more significant. One of those cards that is well made, but lacks a combo to really make it click.